I have a lot of really wonderful memories with Catena wines. There have been lots of great dinners with one of their bottles at our table. Hell, we even had one of their Malbecs as part of my brother’s wedding dinner. Our relationship with these wines really began 7 years ago, although there were almost certainly encounters before then. If we scroll back time to 2012, right now we’d find a younger Greg and Nikki (as many friends call me) having just arrived in Buenos Aires with a group of friends. 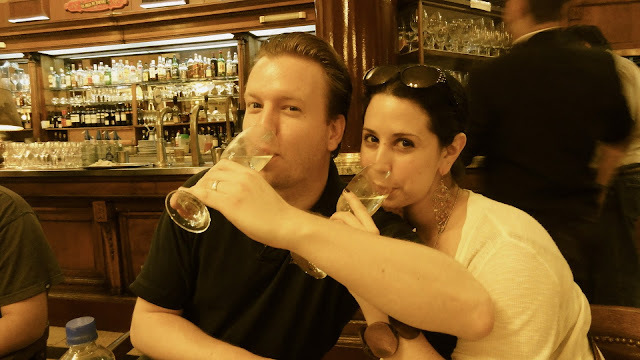 Younger versions of us drinking bubbly in a cafe in Buenos Aires. For me this trip sits in a particularly interesting moment in time. 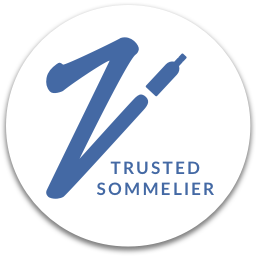 I had graduated from my program and the French Culinary Institute (now the International Culinary Center) just a few weeks before, and the very day I got back I started an intensive program with the Court of Master of Sommeliers which lead to my completing their Intro and Certified levels. So, this trip was at my exact point of transition between wine lover and wine professional. We had a spectacular time. In Mendoza, our crew rented a big house with a beautiful pool where we grilled and ate and swam and drank a lot of wine in between visits to wineries. Pretty freak’n perfect! We still regularly reminisce about this trip. It was all put together by our friend Tommy in celebration of his birthday that year. Last month, this group was all together again for the first time in celebration of his wedding to his lovely wife Victoria. Our Argentina traveling crew visiting Bodega Catena Zapata: Drew, Michael, D-Lo, Tommy, Lucy. Greg, me, Laura, & Rob. You might recognize Drew and Lucy from posts from the Culinary Cabin. Comically, when I recently saw Rob at Tommy's wedding, I didn't recognize him because he now has a beard. (For some season facial hair throws me like Clark Kent's glasses.) Other than that, to me everyone looks remarkably the same, with the exception that some us (me) have put on a few pounds in the interim. With all of these happy memories were very much on my mind, it seemed only appropriate to share a wine and pairing connected to this trip. 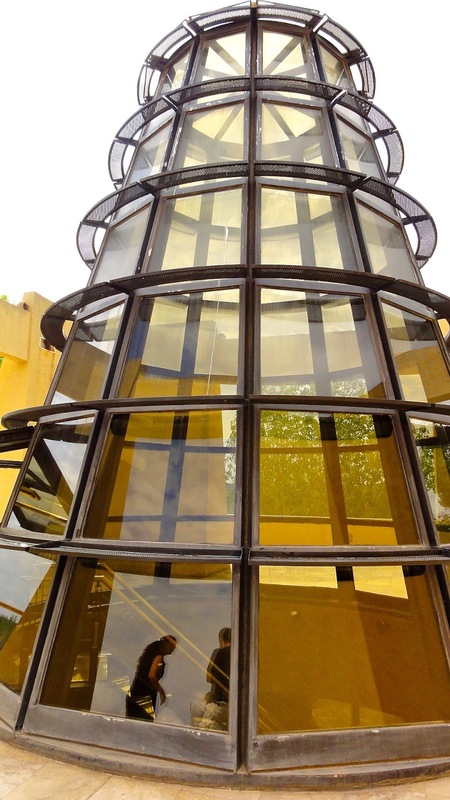 I just like the architectural detail at Bodega Catena Zapata. I’ve gotta confess that I have a bit of a girl crush on Dr. Laura Catena, Nicolás daughter who has picked up the mantle in the family business. In addition to her role as managing director at Catena Zapata and owning her own winery (Luca, named after her son), she’s also a physician working with the emergency department at UCSF and splits her time between Argentina and the Bay Area. She’s also a wife and mother. I swear she must have magical time management super powers. I had the chance to meet her when she poured at Bâtonnage last year, and I freely admit to being a little star struck. Laura has continued to push the ball forward. 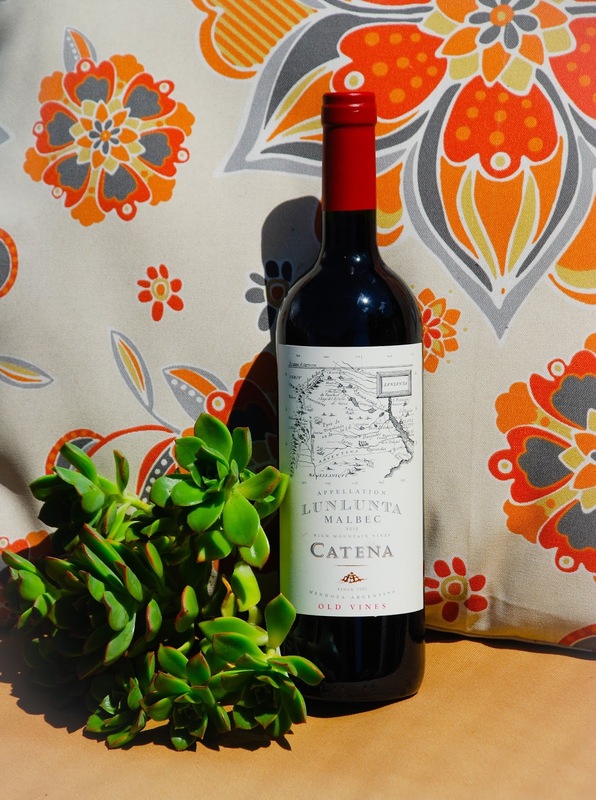 She founded the Catena Institute of Wine in 1995 to better understand Malbec. In particular they’ve done quite a bit of work with the grape in high altitude vineyards which has helped to find new terroirs for the wine in a region that already sits at a generally high elevation. Grown at 2,785 feet, the Lunlunta Malbec is a lovely example and it’s been a favorite of mine the last couple of years. 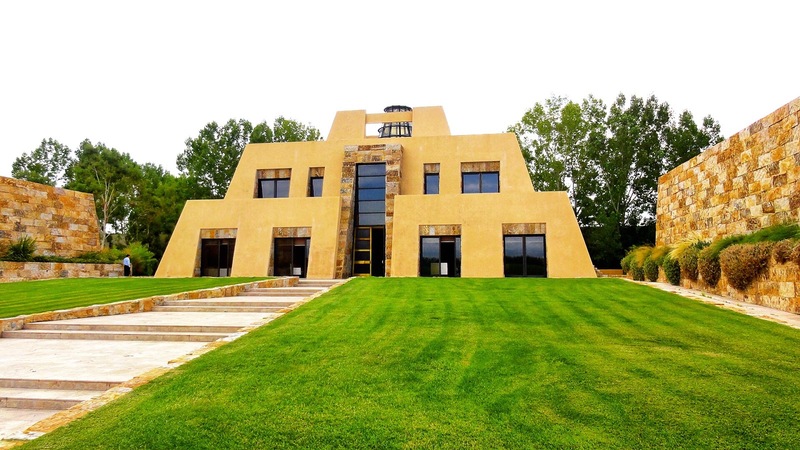 (Catena’s Adrianna Vineyard sits even higher at 5,000 feet.) To me this wine shows all the decadence one might want from an Argentine Malbec, but in a somewhat sleeker style with a stony, minerally backbone. To me it shows more elegance than most and at a completely reasonable price point (low $20’s). 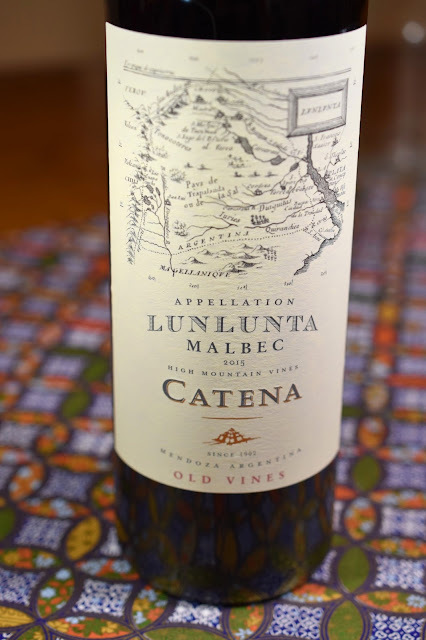 On the day Greg and I opened the Catena Appellation Lunlunta Malbec 2015, Mendoza we picked up notes of blackberries, dark cherries, and spice on the nose, along with a whiff of more savory elements like olive and even something a little meaty. On the palate, more mineral notes joined the party with smoke, earth, and flinty stones, as well as a pinch of herbs. The wine has medium+ body and plenty of structure from supple tannins and balanced acidity. Laura Catena also wrote a book called Vino Argentino which serves as a guide to the country’s wine regions. It also has a substantial selection of recipes to pair with the wine. I thought it would be fun to choose a recipe from this section to pair with the wine for a nice date night in. Argentine Malbec and a steak is such a classic pairing that we ultimately couldn’t resist the temptation of this combination. I decided to adapt a recipe included in Vino Argentino by Francis Mallmann, one of Argentina’s most famous chefs, for Ribeye Steak with Chimichurri and Patagonian Potatoes. I opted for sirloin steaks instead (they were on sale) and made a few changes based on ingredient availability and laziness, including cooking the steaks sous vide, although I've included both sets of instructions. The recipe was also in keeping with the memories of our trip to Argentina during which we’d had soooooooooooo many good steaks. What I didn’t realize when Greg and I picked out this recipe to try, was that we’d actually had Mallmann’s version on our trip at his restaurant in Buenos Aires, Patagonia Sur. It fully completed the trip down memory lane! 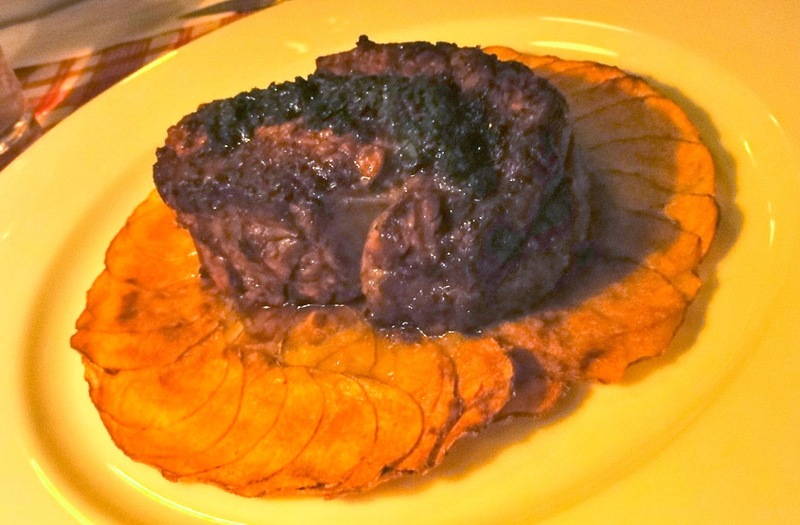 The original version of this dish at Patagonia Sur in Buenos Aires. Maybe not the best shots, but proof that we had it! A it gives you an idea of what it was intended to look like. I’ll admit that on this occasion I didn’t pay as careful attention to the nuances of how the wine and the food interacted together as I normally do. 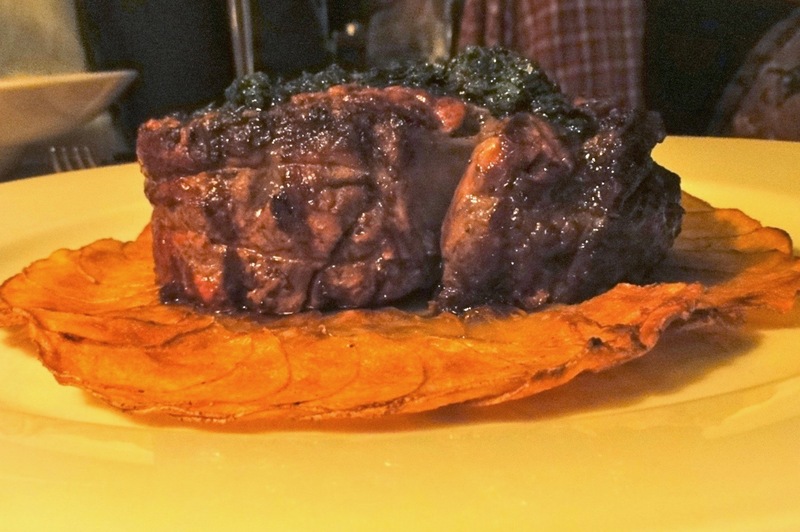 (Although I was surprised at how well the Malbec worked with this rather spicy take on Chimichurri–heat can often be a problem in wine pairing.) In this case, we both just happily gave into the hedonism of the match. MMMMMMMMMMMMMM! My version at home. Not exact, but not half bad and absolutely delicious! The suggested pairings for this wine on Kobrand’s (the importer) site include smoked meats and cheeses, braises, roasts or grilled meats and fowl. Taken from the Kobrand and Catena Zapata Websites. Vineyard name: Lunlunta (Sub-Appellation of Maipu IG). Lunlunta is an idyllic district of small orchards and tree-lined country roads, well known for its ancient Malbec vines and silty-clay soils. Vinification: This wine goes through cold maceration for 5 days at 50ºF (10ºC). The juice is then fermented for 16 days with a post-fermentation maceration of 10 days. 12 months in barrel (35% new). Barrel selection varies depending on vineyard and vintage. 85% French, 15% American oak. I took this pic as part of a photo project I did for Bâtonnage's social media last year. I didn't end up using this one, so added it here for fun. The Average Price for this bottle on Wine Searcher is $23 and that is exactly how much I bought it for at Bay Grape. I really think wine is an elegant Malbec option for the price point and definitely an Overachiever in my book. I often have chimichurri in the fridge and so used up some that I’d previously made as the marinade, and then made a fresh batch of Mallmann’s to have on the side. If you don’t feel like doing all the chopping, you can find a blender version of the sauce here. Yield: 2 steaks. Adapted by Nicole Ruiz Hudson. 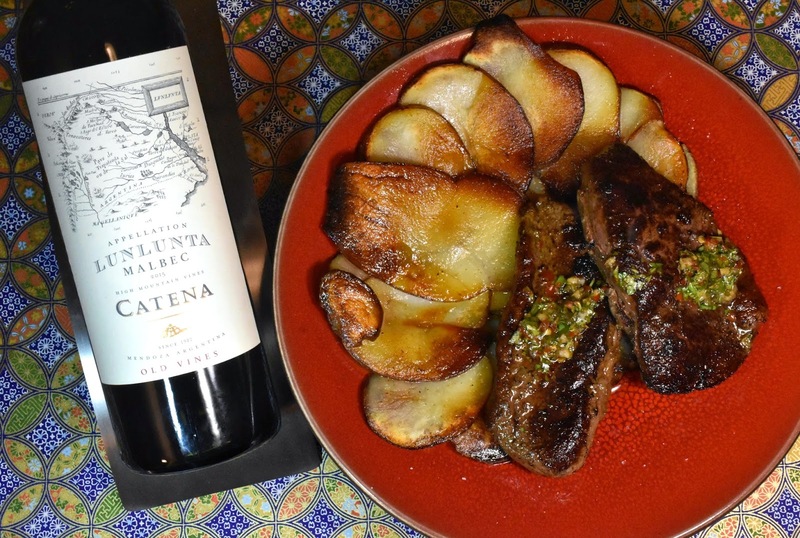 The recipe in Vino Argentino (from which this is adapted) follows a fairly traditional grilling method. I decided to cook mine sous vide, so I’ll include both methods here. I made 2 steaks, the recipe in the book is for 6, you can make basically as many as you’d like. Place the steaks on a large platter and pour chimichurri on top, and turn to coat the well in the sauce. [ ⅔ cup (165 ml) is recommended for 6 rib-eye steaks.] Let stand at room temperature for 2 hours. Remove the steaks from the chimichurri and season with salt and black pepper. Grill the steaks for about 6 minutes on each side for medium-rare, or until an instant-read thermometer inserted in the center of the streaks registers 130°-135°F for medium-rare, or 135° to 140°F for medium. 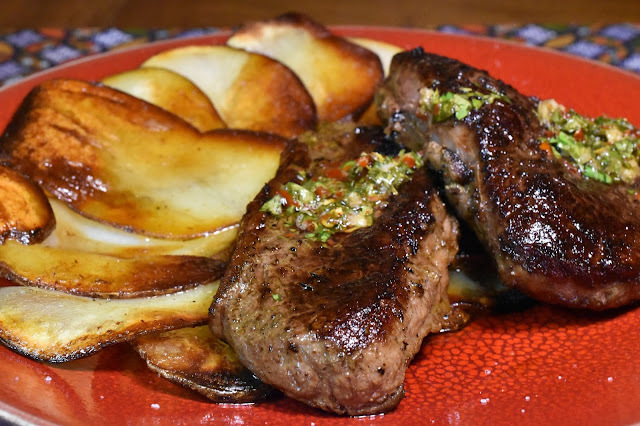 Remove the steaks from pan and allow them to rest for a for minutes before serving on Patagonian potatoes, with a little chimichurri drizzled on top. Light a very hot fire in a large charcoal grill/barbecue or heat a cast iron skillet over medium-high heat. Once hot, be sure to grease the grill or pan with cooking oil. Set up sous vide immersion circulator and preheat water to desired final cooking temperature–129°-134°F for medium-rare. Sprinkle the steaks with salt and pepper and rub with a couple of generous tablespoons of chimichurri. Place the steak(s) in heavy-duty plastic bags. Seal using a vacuum sealer or by slowly lowering ziplock bags with the steaks into the water bath, slowly pushing out the air. Once the bag is lowered the majority of the way into the water, zip up the remainder of the bag. Cook the steak in the water bath for one hour. While the steak is cooking, heat a hot cast iron skillet over medium-high or preheat the grill to high heat. Once the steaks are cooked and pat dry with paper towels, then coat steaks lightly with a little cooking oil. (Make sure to save the juices left in the bag.) Finish the steaks by grilling for 1 to 2 minutes per side or until nicely seared. Remove the steaks from pan, then serve them on the Patagonian potatoes, with a little chimichurri drizzled on top. 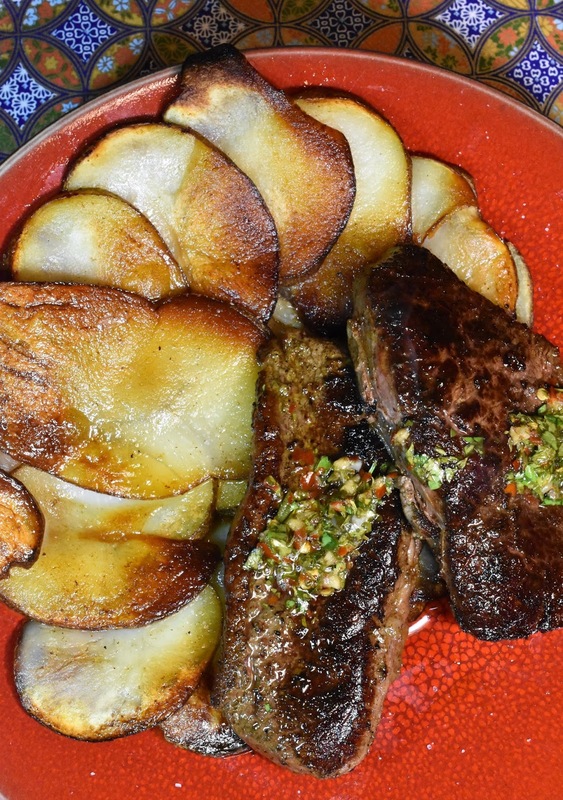 Argentine's use chimichurri as an all-purpose condiment. Ideally, make the chimichurri a day or two in advance (or at least a few hours in advance) so that you can also use it as a marinade. According to the recipe in Vino Argentino , the chimichurri will keep in a glass jar for up to a week. This will yield more than you need for two steaks. Use the rest on eggs, fish, chicken, and meats of all kinds. In a small non-reactive saucepan, bring the water to a boil and add the salt and red pepper flakes. Remove from the heat and stir until the salt has completely dissolved. Let cool. Add the remaining ingredients and stir to combine. Pour into a glass jar, cover, and store in the refrigerator. Yield: 2 Adapted by Nicole Ruiz Hudson. This version of the potatoes is modified from Francis Mallmann’s version in Vino Argentino to make things a little easier for those of us who aren’t regularly practicing flipping things in pans. Rather than flipping them over halfway through cooking as Mallmann does it, I put them under the broiler so as to not risk ruining the formation. His version has the cook make one crispy potato round for each person. Here one big potato round is divided between two people. Slice the potatoes very thinly on a mandoline or with a very sharp knife; do not place them in water as this will remove the starch and prevent potatoes from sticking together. Heat a large cast iron skillet over medium high heat and 1 teaspoon of the butter, tilting the pan to spread the butter as it melts. Lay potatoes in a fan-like, circular pattern, overlapping the slices. Work quickly so as to not burn the butter. Brown the potatoes on the first side for 4 or 5 minutes. Rub the second teaspoon over the top of the potatoes. Transfer the skillet of potatoes under the broiler set on high heat and cook for 5 to 7 minutes, or until the potatoes are cooked through and browned on top. Rotate the pan under the broiler as needed to distribute heat evenly. Remove from heat. 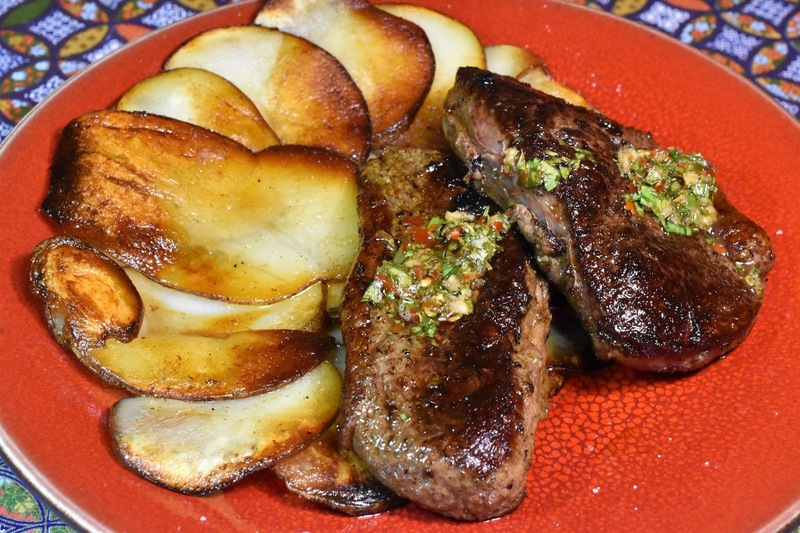 Carefully flip the potatoes onto a plate and serve with the steak and chimichurri. If you’re making your steaks via a traditional method, make the potatoes just before cooking your steaks. If you’re cooking the steaks sous vide, prepare the potatoes while the steaks cook in the circulator. 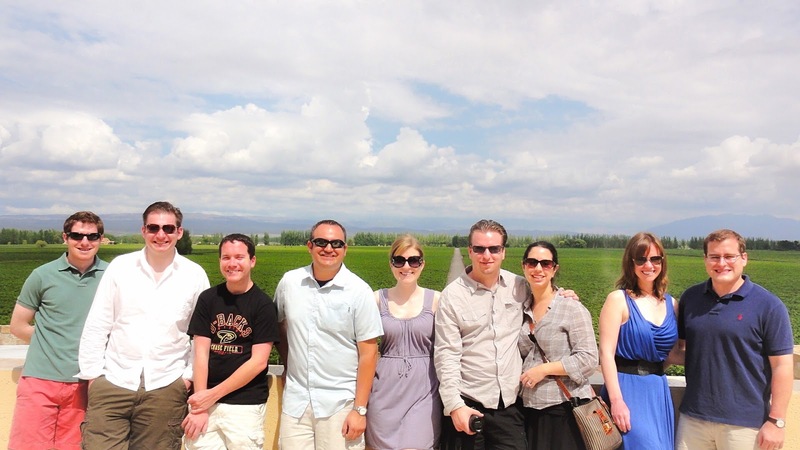 The Wine Pairing Weekend Crew has also been exploring Argentina this month. Be sure to check out what they've cooked up.